Abstract (of title) A history of all transactions shown in the public records affecting a particular tract of land. Acceleration clause A provision in a promissory note that specifies conditions under which the lender may advance the time when the entire debt which is secured by the mortgage becomes due. Acknowledgment A formal declaration before an authorized officer (usually a notary public) by a person who has signed an instrument that such signing is the individual’s act. Adjustable Rate Mortgage (ARM) Mortgage loans under which the interest rate is periodically adjusted, in accordance with some market indicator, to more closely coincide with the current rates. See also graduated payment mortgage. Administrator A person appointed by a court to take possession of the property of a person who died without leaving a will, to pay debts and to distribute the property to those entitled to it according to law. Adverse possession The possession, by one party, of land belonging to another in a manner deemed adverse to the interest of the record owner. Affiant One who swears to or affirms the statement in an affidavit. Affidavit A written statement made under oath before a notary public or other judicial officer. Affirmative coverage Provisions in title insurance policies by which the insurer agrees to indemnify against loss due to specific risks generally not covered by policies. Agreement A legally binding contract made between two or more persons. All-inclusive rate A premium for title insurance that includes the cost of title search and title examination, as well as the risk premium. In some localities, title insurance is priced with an all-inclusive rate; in others, the policy is priced with a risk rate, and the cost of search and examination is separately priced. ALTA (American Land Title Association) The trade association of the title insurance industry, which has adopted certain insurance policy forms to standardize coverage on a national basis. Amortization (amortize) Reduction of the principal of a debt in regular, periodic installments. Appraisal A report from an independent third party detailing the estimated value of real estate. Approved attorney An attorney approved by a title insurance company as one whose opinions of title will be accepted by the company and relied upon for the preparation of title insurance policies. Appurtenance A right or privilege that is attached to another property and is conveyed with it. See also easement and encroachment. Assessed valuation The valuation placed upon land for purposes of taxation. Assessment The valuation of real estate for the purpose of taxes or special improvement charges. Special improvement charges are usually for the costs of streets, sidewalks, sewers, etc. Assignment The act of transferring certain interests in real estate from one party to another, like a mortgage or leasehold interest. Assumption of mortgage An obligation undertaken by a new purchaser of land to be liable for payment of an existing note secured by a mortgage. Attorney-in-fact A person who holds a power of attorney from another to execute specified documents on behalf of the seller of the power. Attorney’s opinion A statement by an attorney as to the validity of a title, arrived at after investigation of the history of the title as recorded in the public records. Back title letter (also called “back title certificate” or “starter”) When titles previously have been examined up to a certain date by reliable examiners, title companies sometimes give subsequent examiners of such titles a letter that sets forth the condition of the title at the time of the previous examination and authorizes them to begin their subsequent examination with the terminal date of the previous examination. Balloon note A promissory note with amortization payments scheduled for a long-term, usually 30 years, but maturing in a shorter term, often five to seven years. It requires a substantial final balloon payment for the remaining principal. Bankruptcy A federal court proceeding under the U.S. bankruptcy laws where an insolvent debtor either has its estate liquidated and its debts discharged or is allowed to reorganize its affairs under the protection of the bankruptcy court. Base title (also called a “basic title”) Title to an area or tract out of which parts are subsequently conveyed or from which a subdivision or development is made. Beneficiary (of a trust) A person designated to receive benefits from a trust estate. Building lines (also called “setback lines”) Lines fixed at a specified distance from the front or sides of a lot or at a certain distance from a road or street. No building on the lot may project outside the area defined by the building lines. Building codes Local or state laws that control accepted building and construction practices. Certificate of title A certificate issued by a title examiner stating the condition of a title. Chain and link In real estate measurements (surveying), a chain is 66 feet long or 100 links, each link being 7.92 inches. Chain of title The history of successive ownership and transfer in the title to a tract of land. Claim An adverse right or interest asserted by one party against another or against an insurer or indemnitor. Clear title Real property ownership free of liens, defects, encumbrances, or claims. Closing (also called “settlement”) The completion of a real estate transfer, where the title passes from seller to buyer, or a mortgage lien is given to secure debt. Closing costs Miscellaneous expenses involved in closing a real estate transaction over and above the price of the land. Clouded title A land title having an irregularity, possible claim, or encumbrance that, if valid, would adversely affect or impair it. Coinsurance Two or more title insurance policies issued by different insurers, each covering a portion of the same risk, which together provides total coverage of the risk. Collateral Marketable real or personal property which a borrower pledges as security for a loan. Commitment A document issued by a title insurance company that contains the conditions under which a policy of title insurance will be issued. Common elements (also called “common area”) In condominiums and cooperatives, the common elements are everything except units. In a planned community, it is land owned by the community association. Common interest community Real estate that a person, by virtue of their ownership of a unit, is obligated to pay for real estate taxes, insurance premiums, maintenance, or improvement of other real estate described in a declaration. Community property The law in some western states that recognizes all property acquired by a husband and wife, or either, during marriage (except property specifically acquired by a husband or wife as separate property), as owned in common by both of them. Condemnation The taking of private property for a public purpose with compensation to the owner under the right of eminent domain. Governmental units, railroads and some utility companies have the right to condemn and take private property. Condominium A statutory form of real estate development of separately- owned units and jointly-owned common elements in a multi-unit project. See also cooperative, common interest community, or planned unit development. Consideration Anything of legal value that encourages someone to enter into a contract. Construction disbursement service A direct payment plan for disbursement of construction loans and equity funds through the title insurance company as an independent escrow agent to subcontractors and suppliers upon approval of the owner, general contractor, and lender. Construction financing A loan made to finance construction of improvements on land. Constructive notice A presumption in law that prevents a party from denying knowledge of facts where the party has a duty to inquire. Contract of sale Agreement by one person to buy and another person to sell a specified parcel of land at a specified price. Conveyance The transfer of title to property from one person to another. Cooperative An apartment building owned by a corporation that gives possession to individual apartments by proprietary leases appurtenant to shares of the stock of the corporation. Transfer of title to the shares transfers the lease. See also condominium, common interest community, and planned unit development. Cotenancy Ownership of an interest in a particular parcel of land by more than one person. Covenant A formal agreement or contract between two parties in which one party gives the other certain promises and assurances in a warranty deed. It is often used to indicate a single promise within an agreement that contains several promises. Declaration The document that establishes a condominium, cooperative, or planned community and describes the most important property rights of the unit owners. Dedication The setting aside of certain land by the owner and declaring it to be for public use, e.g., streets, sidewalks, and parks in a development. Deed An instrument for conveying real estate. Deed of trust A form of security instrument for mortgage loans. Deed restriction A covenant contained in a deed imposing limits on the use or occupancy of the real estate, or the type, size, purpose, or location of improvements to be constructed on it. Default A failure to meet legal or contractual obligations. Defect An imperfection or deficiency. Deficiency judgment When the proceeds from a foreclosure sale are less than the amount due on the debt. Depreciation Loss in value due to ordinary wear and tear, destructive action of the elements, or economic obsolescence. Devise A gift of real estate made by a will. See also grantor and heir. Discount point(s) The amount of money the borrower or seller must pay the lender to get a mortgage at a stated interest rate. Dominant estate The property benefited by an easement. Draw Disbursement of a portion of the mortgage loan. Earnest money A deposit of funds made by a buyer of real estate as evidence of good faith. Easement A non-possessory right to use all or part of the land owned by another for a specific purpose. See also appurtenance and encroachment. Eminent domain The power of a government to take privately-owned property for public purposes under condemnation proceedings, subject to payment of its fair market value. Encroachment Any building, improvement, or structure (such as a wall, fence, or driveway) located on one property that intrudes upon the property of another. See also appurtenance. Encumbrance Any interest, right, lien, or liability attached to a parcel of land (such as unpaid taxes or an unsatisfied mortgage) that constitutes or represents a burden upon the property. Endorsement A form issued by the insurer at the request of the insured which changes terms or items in an issued title insurance policy or commitment. Equity The market value of real property, less the amount of existing liens. Equity funds The purchaser’s investment in the purchase of land, not including any loan proceeds. Equity participation A mortgage transaction where the lender, in addition to receiving interest on the loan, acquires an interest in the borrower’s land and shares in the profits derived from the land. See also shared appreciation mortgage. Escheat The reversion of property to the state when an owner dies or disappears leaving no legal heirs, devisees,or claimants. Escrow Closing a real estate transaction when all required documents and funds are placed with a third party for processing and disbursement. Estate The degree, quantity, nature, and extent of interest that a person has in land. Estoppel A legal restraint that stops or prevents a person from contradicting or reneging on their previous position, assertions, or commitments. Examination The study of the instruments and muniments to a chain of title in order to reach a conclusion as to the status of the title. Exception A provision added to Schedule B of a title insurance binder or policy to limit the liability of the insurer for a specific title defect or an outstanding lien or encumbrance. Exclusion Those general matters affecting title to real property excluded from coverage in the Exclusions from Coverage of a title insurance policy. Execute To sign a legal instrument. A deed is said to be executed when it is signed, sealed, witnessed, and delivered. Executor A personal representative named in a will to administer the estate. “Executrix” is the feminine form. Fannie Mae (FNMA) Federal National Mortgage Association. A U.S. government-sponsored corporation dealing in the purchase of first mortgages for the secondary market. Federally-insured loan A mortgage loan that originates in a federally-insured governmental program like the FHA. Fee simple estate (or estate in fee simple absolute) An estate in land of inheritance without condition belonging to the owner. FHA (Federal Housing Administration) A federal agency that insures first mortgages, enabling lenders to lend a very high percentage of the sale price. Flexible interest rate See variable interest rate. Fixed-rate mortgage A mortgage having a rate of interest that remains the same for the life of the mortgage. Fixtures Personal property that is attached to real property and is treated as real property while it is attached, e.g., medicine cabinets, window blinds, and chandeliers. Foreclosure A legal proceeding following a default by a borrower in which real estate secured by a mortgage or deed of trust is sold to satisfy the underlying debt. Forgery The fraudulent signing of another’s name to an instrument such as a deed, mortgage, or check. Freddie Mac (FHLMC) Federal Home Loan Mortgage Corporation. A federal agency that purchases both conventional and federally- insured first mortgages from members of the Federal Reserve System and the Federal Home Loan Bank System. General warranty deed A deed containing a covenant by the seller to protect the buyer against being dispossessed due to adverse claims against the land. Ginnie Mae (GNMA) Government National Mortgage Association. A federal association working with the FHA that offers special assistance in obtaining mortgages and purchasing mortgages in the secondary market. Good faith (1) Honest intent, or (2) without notice of any circumstance that would make a party suspect wrongdoing or fraud in a transaction. Good faith estimate The Real Estate Settlement Procedures Act (RESPA) requires creditors to provide a good faith estimate of closing costs and a settlement statement listing the amounts paid by the consumer. If the creditor does not know the precise credit terms, the creditor must base the disclosures on the best information reasonably available and indicate that the disclosures are estimates. See also RESPA. Graduated payment mortgage A mortgage securing a loan where the initial monthly payments on the loan are insufficient to satisfy interest payments at the stated interest rate and payments increase in accordance to a schedule. See also adjustable rate mortgage. Grant A transfer or conveyance, implying that the transferor asserts that it has some title to something conveyed. Grantee The buyer, or one to whom property is transferred. Grantor The seller, or one who transfers property to another. Guaranty policy A title insurance policy that insures only against defects of title appearing in the public records. Heir The person who, at the death of the owner of land, is entitled to the land if the owner has died without a will. See also devise and intestate. Hereditaments Any and all kinds of estates, interest, and rights in real estate that can be inherited. Homeowner’s insurance Real estate insurance protecting against loss caused by fire, some natural causes, vandalism, etc., depending on the terms of the policy. Also includes coverage such as personal liability and theft away from home. Homestead (exemption) A person’s dwelling and that part of the land close to the dwelling. Many states by statute give special privileges to such lands, such as exemptions from remedies of creditors. HUD (Department of Housing and Urban Development) The federal department responsible for the major housing programs in the United States. Indemnify To protect, hold harmless against loss. Indemnitor The party obligated in an indemnity agreement to protect or repay another for a loss. Indemnity against liability Requires the indemnitor to respond and protect the creditor as soon as a claim is made against the creditor, even if the creditor has yet to suffer an actual loss. Indemnity against loss Requires the indemnitor to reimburse its creditor if the creditor has actually suffered a loss. Indemnity agreement An agreement by the maker of the document to protect or repay another of the agreement up to the limit stated for any loss due to the contingency stated on the agreement. Index An alphabetical listing in the public records of the parties to recorded real estate instruments with the book and page number of the record. Insurable title A land title that a title insurance company is willing to insure. Insured closing service An agreement by the title insurer to indemnify the insured for any loss in settlement funds caused by (1) the failure of the company’s policy-issuing agents or approved attorneys to conform to closing instructions of the insured, or (2) fraud or dishonesty of the issuing agent or approved attorney. Interest A fee for the use of someone else’s money. Interval ownership A time share estate where the unit purchaser is deeded an estate for years, giving a right to occupy the unit for a particular week during a stated number of years with a remainder interest in fee as a tenant in common with all other purchasers of the unit. Intestate Without having made a valid will or one who dies without having made a will. See also heir and testate. Joint tenancy An estate in cotenancy that must not only be specified in the grant, but also requires three “unities.”All joint tenants must receive title in the same conveyance, beginning at the same time, and with undivided possession. Joint tenants Persons who own an estate in joint tenancy. Judgment The decision of a court regarding the rights of parties in an action. Junior mortgage A mortgage lower in lien priority than another, for example, a second mortgage or home equity line. Lawsuit A dispute between two or more parties that has been referred to the court system by one of them. Lease A written instrument creating a right of possession to land for a set term, usually in exchange for periodic rent payments. Leasehold The right to possession and use of land for a fixed period of time created in a lease. Legal description A description of real property that is sufficient to locate and identify it. Lessee A tenant holding a leasehold. Lessor A landlord; one who gives a leasehold to a lessee. License Permission to go upon or use the land of another, the permission being a personal privilege and not constituting an interest in the land. A license can be revoked at any time. Lien A monetary charge imposed on a property, usually arising from some debt or obligation. Lien waiver (also called a “waiver of liens”) A waiver of lien rights by someone providing labor or materials for the improvement of specified land. Life estate An individual’s right to the use and occupancy of real estate for his or her life. Link In surveying, a length of 7.92 inches. One hundred links equal a chain, or 66 feet. Lis pendens A legal notice that there is litigation pending relating to the land, and a warning that anyone obtaining an interest subsequent to the date of the notice may be bound by the judgment. Loan policy (also called “mortgagee policy”) A title insurance policy insuring a mortgagee, or beneficiary under a deed of trust, against loss caused by invalidity or unenforceability of a lien, or loss of priority of the mortgage or deed of trust. Loan-to-value ratio The ratio of the amount of the loan divided by the fair market value of the land held as security for the loan. Lot Any portion or parcel of real property. Usually refers to a portion of a subdivision. Marketable title A title which a reasonable purchaser, well informed as to the facts and their legal meaning, would be willing to accept. Market value The average of the highest price that a buyer would pay and the lowest price a seller would accept. Mechanic’s lien A lien on real estate that secures the payment of debts due to persons who perform labor or services or furnish materials incident to the construction of buildings and improvements on the real estate. Metes and bounds A land description in which boundaries are described by courses, directions, distances, and monuments. Mortgage A conditioned pledge of property to a creditor as security for the payment of a debt. Mortgage insurance Insurance written by an independent mortgage insurance company protecting the mortgage lender against loss incurred by a mortgage default, thus enabling the lender to lend at a higher loan-to-value ratio. 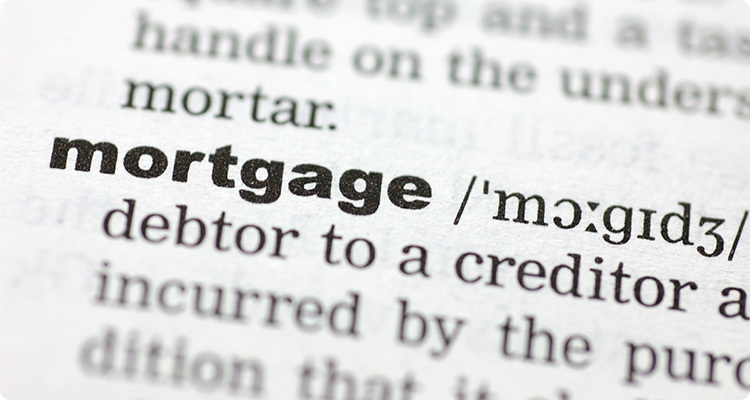 Mortgagee The holder of a mortgage. Mortgagee policy See loan policy. Mortgagor A person who gives a mortgage on his or her property to secure an obligation, usually the repayment of a debt. Multiple listing The pooling in a central bureau of listings of properties for sale. Muniments of title Written evidence (documents) that an owner possesses to prove his or her title to property. See also examination. Negative amortization Increases in the principal amount of indebtedness caused by underpayment of the interest due in each installment. Note (also called a “promissory note”) A written promise to pay a sum of money, usually at a specified interest rate, at a stated time to a named payee. Open-end mortgage A mortgage or deed of trust written to secure and permit advancing of funds in addition to the amount originally loaned. Option The right to buy sell, or lease land at a fixed price within a specified time. Owner’s policy A title insurance policy insuring an owner of real estate against loss occasioned by defects or unmarketabilit of the owner’s title. Parcel A part or portion of land. A lot. Partition A division of land, usually by a legal proceeding, among the parties who were formerly co-owners. Permanent financing A loan secured by land after construction of improvements have been completed. Personal property Anything that can be owned, but not designated by law as real property. Personal representative The executor or administrator of the estate of a deceased person who manages and distributes the estate on behalf of the deceased. Planned Unit Development (PUD) or Planned Community A project consisting of individually owned parcels of land together with common elements that are owned by a homeowner’s association. Plant A collection of title information that helps in expediting title examinations, such as copies of previous attorneys’ opinions, abstracts, tax searches, and copies or take-offs of the public records. Plat (of survey) A map dividing a parcel of land into lots, as in a subdivision. Point(s) (also called “commission points” or “discount points”) One percent of the amount of the loan. Power of attorney A written instrument by which one person authorizes another, the attorney-in-fact, to act on his or her behalf. Premium The amount payable for an insurance policy. Prepayment penalty Penalty to the mortgagor for paying the mortgage before it becomes due. Principal A sum of money owed as a debt on which interest is payable. Probate The process of validating a will before a court after the death of its maker. Public records Records which by law disclose constructive notice of matters relating to land. Purchase money mortgage A mortgage given by a purchaser to a seller on a property to secure payment of a part of the purchase price. Quieting title The removal of a cloud on title by property action in a court. Quitclaim deed A transfer of interest the transferor may have in the thing conveyed. Real estate (also called “real property”) Land and anything permanently affixed to the land, such as buildings, fences, and those things attached to the buildings, such as plumbing and heating fixtures, or other such items that would be personal property if not attached. Real property See real estate. Recording The noting in a public office of the details of a legal document, such as a deed or mortgage, affecting the title to real estate. Redemption The right of the owner in some states to reclaim title to property if it pays the debt to the mortgagee within a stipulated time after foreclosure. Registered land Land registered in a Torrens system. Reinsurance A contractual relationship between two insurance companies under which one insurer assumes a portion of the risk of the insurance policy written by the other. Reissue rate A reduced rate of title insurance premium where the owner of the land has been previously insured by an owner’s policy by the insurer within a certain time. REIT Real Estate Investment Trust. A business trust which deals principally with interest in land. Release To relieve from debt or security or abandon a right, such as the release of a mortgage lien from a part or all of the land mortgaged. Renegotiable rate mortgage A loan secured by a long-term mortgage of up to 30 years, which provides for renegotiation at equal stated intervals of the interest rate for a maximum variation of 5 percent over the life of the mortgage. RESPA The Real Estate Settlement Procedures Act (12 U.S.C. 2601) that, together with Regulation X promulgated pursuant to the Act, regulates real estate transfers involving a “federally-related mortgage loan” by requiring, among other things, certain disclosures to borrowers. Restrictive covenants Limitations on the use of property imposed or created by deeds or other documents in the chain of title. Reverse annuity mortgage A mortgage given to a homeowner who desires to convert the equity in his or her house to an income-producing asset. The proceeds of the loan are paid out in periodic installments to the homeowner, thus giving the homeowner income until the proceeds paid out equal the face amount of the mortgage. Right of way See easement. Riparian rights The rights of owners of lands bordering watercourses which relate to the water and its use. Sale and leaseback The sale of an asset to a buyer who immediately leases it back to the seller. Satisfaction An instrument releasing the lien of a mortgage. Secondary market A market system for the purchase and sale of mortgage loans, often gathered into pools and traded as mortgage-backed securities. Security Protection against loss, usually with a lien created by a mortgage, pledge, or a deposit given by a borrower to its creditor. Senior lien or mortgage If there is more than one lien on land, those liens are ranked by priority. A senior lien or mortgage is entitled to be paid first in foreclosure or bankruptcy, before a junior lien. Separate property Property a husband or wife owns independently of the other. Service charge A charge paid by the borrower to the lender for the lender’s expenses in processing the loan. Servient estate The land burdened by an easement. Settlement funds All of the money, from the buyer, the buyer’s lender, or any other source, that is necessary to meet all obligations created in a real estate transaction. Shared appreciation mortgage A loan having a fixed interest rate set below the market rate for the term of the loan which provides for contingent interest based upon a percentage of the appreciation in the value of the security at the sale or transfer of the property, or the payment of the loan. Simultaneous issue An owner’s policy and a mortgagee policy issued by a title insurer on the same interest at the same time. Special warranty of title A covenant by a seller of land to protect the buyer against being dispossessed because of any adverse claims to the land by the seller, or anyone claiming through the seller. Standard coverage policy A form of title insurance which contains certain standard printed exceptions not included in the ALTA policies. Starter See back title letter. Subcontractor A party having a contract with another contractor instead of contracting directly with the owner. Subdivision A tract of land surveyed and divided into lots for purposes of sale. Subordination Placing in a lower class. Subrogation The substitution of one person in the place of another with reference to a claim, demand, or right, so that the individual who is substituted succeeds to the rights of the other in relation to the debt or claim and its rights, remedies, or securities. Substitution loan and substitution rate A loan made to the same borrower on the same land, or by the same lender on the same land, the title to which was insured by the insurer in connection with the original loan. Surety A person who agrees to be responsible for a debt or obligation of another. Take out loan A permanent mortgage loan which a lender agrees to make to a borrower upon completion of improvements on the borrower’s land. The proceeds of the loan are used principally to pay off the construction loan. Tax deed The deed given to a purchaser at a public sale of land for nonpayment of taxes. It conveys to the purchaser only such title as the defaulting taxpayer had and does not convey good title to that extent unless statutory procedures for the sale were strictly followed. Tenancy by the entirety (or entireties) A survivorship estate in land permitted in many states that may only vest in a husband and wife. The couple must receive title in the same conveyance, beginning at the same time, and with undivided possession. If either the husband or wife dies during the estate, title vests in the survivor. In a tenancy by entireties, the husband and wife together are treated as one entity. Both are required to act. Tenant One who has right of possession of land by any kind of title. Tenants in common Ownership of an interest in land by two or more persons with distinct titles, but with unity of possession. Testate Having made a will. One who makes a will is known as the “testator” or “testatrix.” See also heir and intestate. Time share ownership A technique for dividing the title to a commercial property or a vacation home among many different owners, with each owner acquiring the right to occupy the premises during a specified portion of each year. Timeshare unit An interest in a residential or commercial property which by contract or by conveyance of a real property interest allows a purchaser to occupy the unit during a particular week or weeks for a stated number of years. Time span ownership A time share estate where the unit purchaser is deeded an undivided percentage interest in the unit as a tenant in common with all other purchasers and the right to occupy the unit for a particular time period is governed by contractual provisions of the time share declaration. Title A combination of all the elements that constitute the highest legal right to own, possess, use, control, enjoy, and dispose of real estate or an inheritable right or interest therein. Title covenants Covenants customarily inserted in conveyances and in transfers of title to real estate for the purpose of giving protection to the purchaser against possible insufficiency of the title received. Title defect Any possible or patent claim or right outstanding in a chain of title that is adverse to the claim of ownership. Title insurance policy A contract of title insurance under which the insurer, in keeping with the terms of the policy, agrees to indemnify the insured against loss arising from claims against the insured interest. Title search A review of all recorded documents in the land records relating to a particular piece of real property to determine the present condition of title. Tract A lot or parcel of land. Torrens system A governmental title registration system. Certificates of title are issued by the Registrar of Title to landowners as evidence of their title to land. Trust A right of property held by one party (the trustee) for the benefit of another (the beneficiary). Truth-in-lending The federal Truth in Lending Act, 15 U.S.C. Sec. / 1601, et seq., governs the disclosure of information related to certain consumer financial transactions and requires those in the lending business to make the disclosures to their individual borrowers. Underwriter An insurance company that issues insurance policies to the public or to another insurer. Unit A space in a condominium, cooperative, or planned community for separate ownership or occupancy. A unit’s physical boundaries are usually defined by statute and described in the declaration. Usury A statutory crime of charging an unlawful rate of interest in exchange for a loan of money. Variable interest rate (also called a “flexible interest rate”) An interest rate that fluctuates as the prevailing rate moves up or down. In mortgages, there are usually maximums as to the frequency and amount of fluctuation. Vest To give an immediate, fixed right of present or future enjoyment in land. Veterans Administration (VA) loans Housing loans to veterans by banks, savings and loans, or other lenders that are guaranteed by the Veterans Administration, enabling veterans to buy a residence with little or no down payment. Waiver The voluntary and intentional relinquishment of a known right, claim, or privilege. Warranty In a broad sense, an agreement by a seller to be responsible for present or future losses of the purchaser occasioned by deficiency or defect in the quality, condition, or quantity of the thing sold. In a stricter sense, the provision or provisions in a deed, lease, or other instrument conveying or transferring an estate or interest in real estate under which the seller becomes liable to the purchaser for defects in or encumbrances on the title. See also title covenants. Warranty Deed A deed in which the seller warrants or guarantees that good title is being conveyed. Will A testamentary disposition of property, usually in a form prescribed by law, that takes effect upon death. See also intestate and testate. Zoning Land use laws or ordinances passed by local governments regulating the size, type, structure, nature, and use of land or buildings.